Energy in the body has a variety of names, including prana, meridians, auras, chakras, chi, life force, qi and bioelectromagnetic fields. Many cultures have developed practices to work with energy in the body. These practices include qigong, reiki, acupuncture, pranic healing, theta healing, acupressure, yoga, reflexology, shiatsu massage, cranial sacral therapy and biodynamic osteopathy. Regardless of the specific name, there is a consensus among practitioners of these disciplines that energy movement through the body is essential to a healthy life. Vision is also affected by these energy flows. 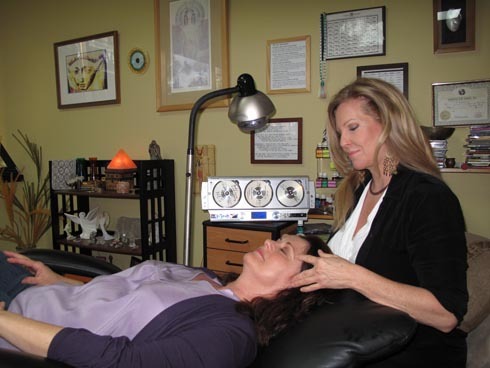 At the Center, Dawn incorporates a variety of therapies to direct a more productive flow of energy through the body. Dawn releases stress and tension in the neck and head in order to restore the cranial rhythm, which enhances vision. Dawn facilitates the flow of energy through the use of olfactory, tactile and auditory stimulation. The specific approach for each client is a specialized configuration of energy work techniques and is subject to change over time based on the client’s progress. Changes are closely monitored and addressed due to the one on one nature of the therapy. All energy work is based on the goal of improving the client’s vision to the greatest potential.